Last night in Hollywood, California, we along with a handful of celebs and Rolls owners got the chance to check out the latest addition to the Rolls-Royce lineup, the 2019 Cullinan. 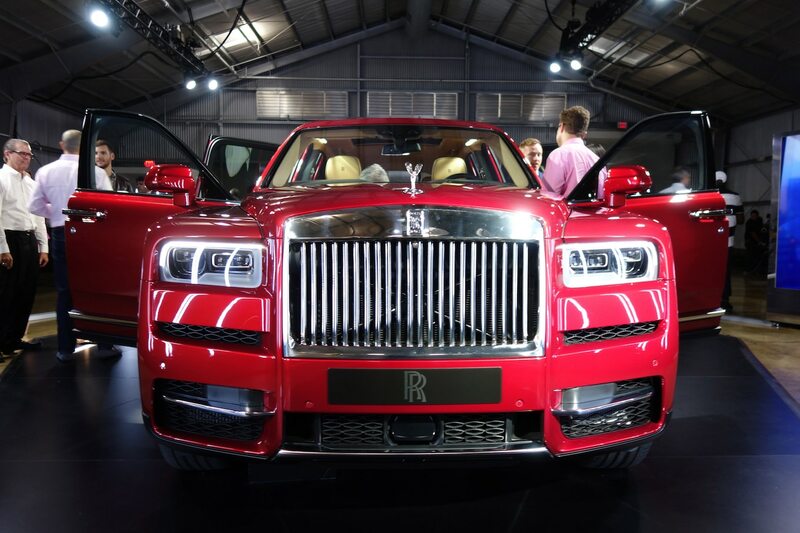 Two SUVs—or “high-bodied cars,” as Rolls likes to say—were in attendance, including one finished in a fresh coat of Magma Red paint and another in a more conservative shade of gray. Up front, the 2019 Rolls-Royce Cullinan is big and imposing with its stainless steel pantheon grille. Its hood line is much higher and its high-bodied side profile is longer than any luxury SUV around. Around back there’s a two-piece tailgate that closes like the clasp on the finest Swiss-made watch at the push of a button. Under the hood, a twin-turbo 6.75-liter V-12 engine delivers 570 hp and 627 lb-ft of torque. The V-12 is mated to an eight-speed automatic transmission and all-wheel drive. The SUV is available in two configurations—Lounge Seats for five passengers or Individual seats for four. For the first option, the seats electronically fold down completely to create a flat load area and can be configured in a 2/3 and 1/3 split. With the seats up, the rear compartment offers up to 21.2 cubic feet of storage space. The Individual Seat configuration is designed for rear passenger comfort and features a fixed glass partition to keep it sealed from the rear luggage compartment. This may make it more difficult to haul your larger Rembrandt masterpieces, but ensures plenty of sound and weather insulation for its occupants. It also allows for a removable Viewing Suite module that produces two comfortable leather seats and a cocktail table that emerges from the rear tailgate for the ultimate in tony tailgating—again with the touch of a button. There’s also an optional ashtray and lighter in the door panels along with umbrella stowage and a center console drinks cabinet that’s comes in handy for all types of adventures. We can’t wait to take it for a long spin—so stay tuned for our driving impressions in the near future. If you like what you see, you might want to put in your order right away. Lucky new owners can expect deliveries to start this winter.